Fordham University Press, 9780823226276, 547pp. 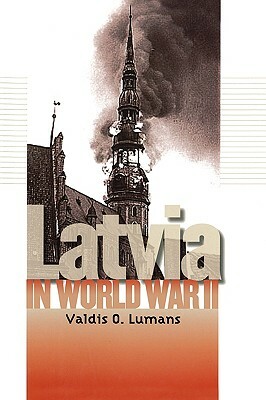 Valdis Lumans provides an authoritative, balanced, and comprehensive account of one of the most complex, and conflicted, arenas of the Second World War. Struggling against both Germany and the Soviet Union, Latvia emerged as an independent nation state after the First World War. In 1940, the Soviets occupied neutral Latvia, deporting or executing more than 30,000 Latvians before the Nazis invaded in 1941 and installed a puppet regime. The Red Army expelled the Germans in 1944 and reincorporated Latvia as a Soviet Republic. By the end of the war, an estimated 180,000 Latvians fled to the West. The Soviets would deport at least another 100,000. Drawing on a wide range of sources--many brought together here for the first time--Lumans synthesizes political, military, social, economic, diplomatic, and cultural history. He moves carefully through traditional sources, many of them partisan, to scholarship emerging since the end of the Cold War, to confront such issues as political loyalties, military collaboration, resistance, capitulation, the Soviet occupation, anti-Semitism, and the Latvian role in the Holocaust. Valdis O. Lumans is the Cleora Toole Murray Professor of History at the University of South Carolina Aiken. He is the author of Himmler's Auxiliaries: The Volksdeutsche Mittelstelleand the German National Minorities of Europe, 1933-1945.